Steve does volunteer work for the Computer History Museum. He’s helped them to collect oral histories of some of the seminal people in the creation of our information age. Three pioneers of the digital revolution were honored at a gala a the museum on Saturday night. We used up our frequent flyer miles to go. It was a short trip, just Friday afternoon to Sunday after lunch, but we managed to fit quite a lot in. I got a present for a friend who keeps an eye on Tonk while I’m away, and some cookies for Lily, and a new toy for Scooter. That’s my kind of shopping. 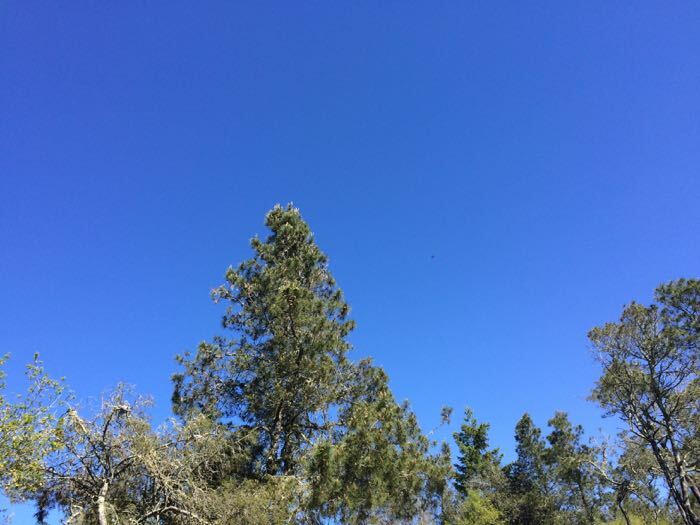 We were east of the San Francisco Bay area, which means that the skies were bright blue. 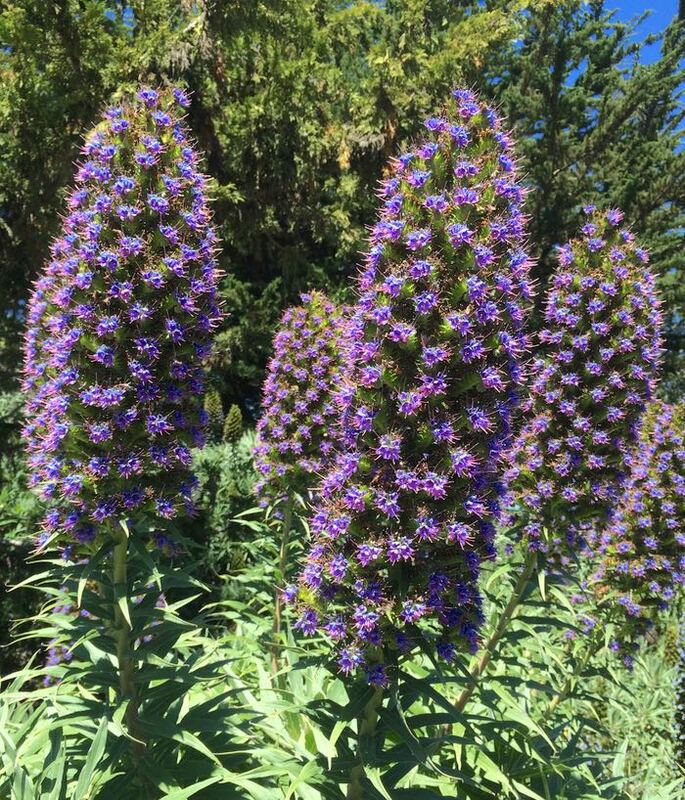 They’ve recently had rain, and so flowers were in bloom everywhere. 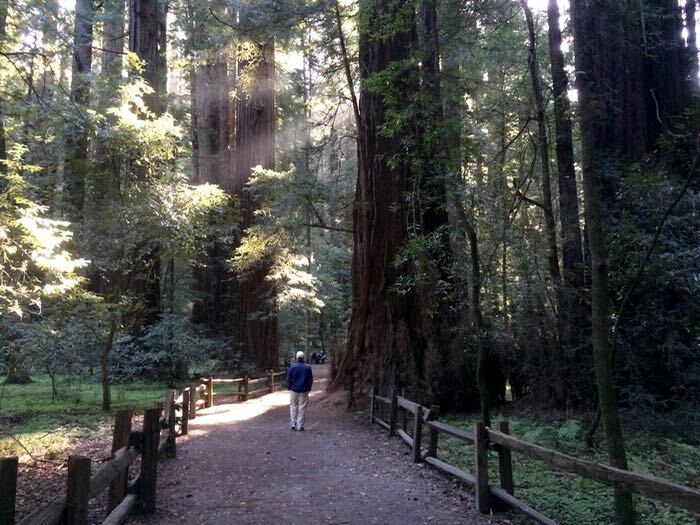 On Saturday morning we strolled the paths at the Henry Cowell Redwoods State Park. I’ll let the photos tell you how amazing it is to walk among these giants. 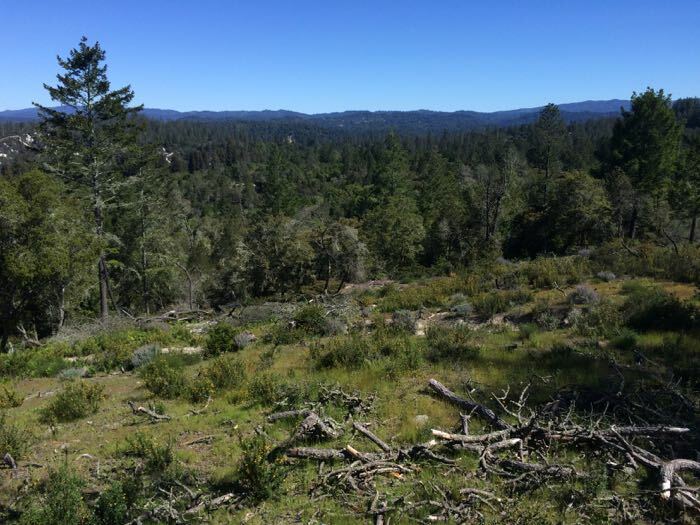 The redwoods aren’t the only special ecosystem in that part of the country. Nearby is a very unique environment called the Sandhills. 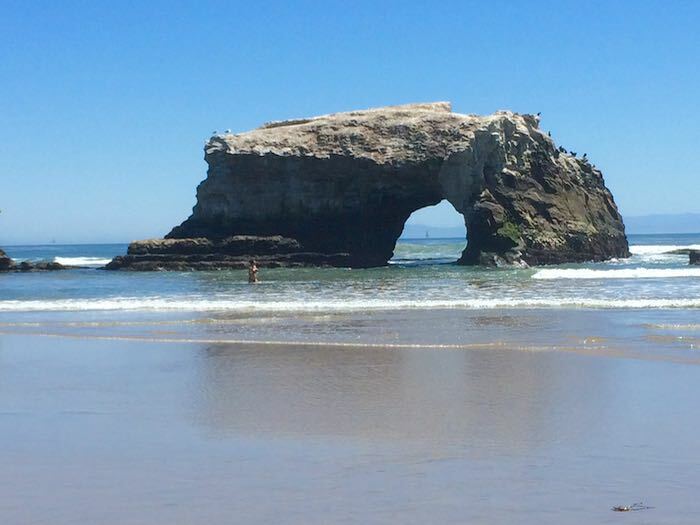 Then it was on to Santa Cruz to the aptly named Natural Bridges State Beach. Look closely at the arch and you’ll see it’s a favored spot of ocean birds, including pelicans. Then turn around and look towards land. The hillside is covered in flowers, and the rocks covered in creatures like barnacles and chitons. 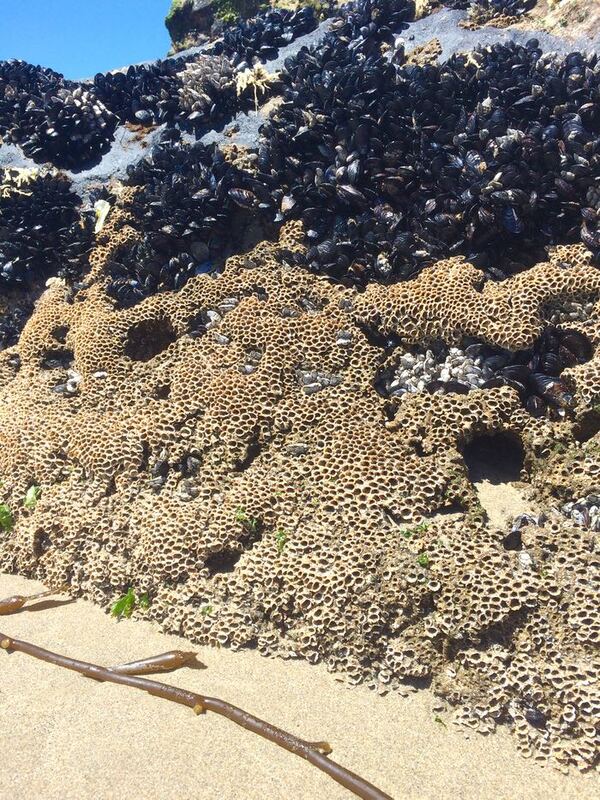 Look even more closely and you’ll find tide pools with fantastical anemones. 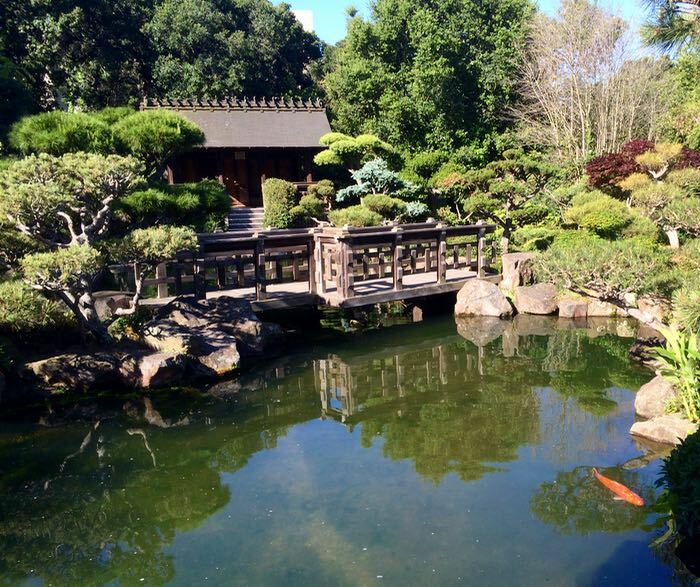 On Sunday morning we had just enough time to go to a more serene and less wild place, the Japanese Garden in Hayward. It made me realize that the Beast is still just a youngster. She could get even bigger! 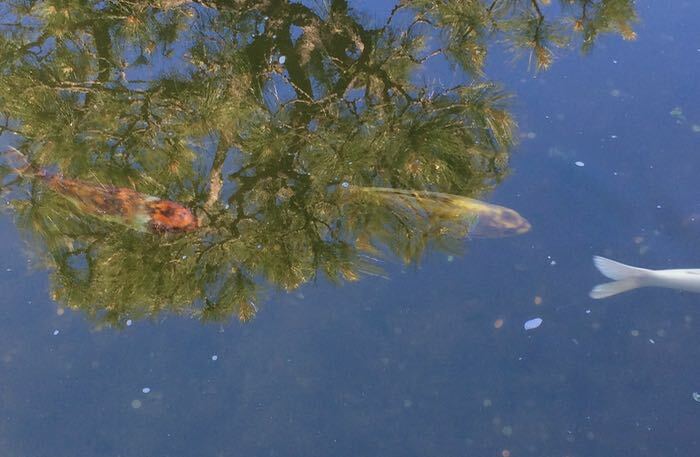 It was so still that I was able to take this photograph of the koi swimming through the trees reflected in the water. On the way to the airport we were able to squeeze in visits to two more stores, one a tack shop where I picked up some new reins for Tonk’s bridle. 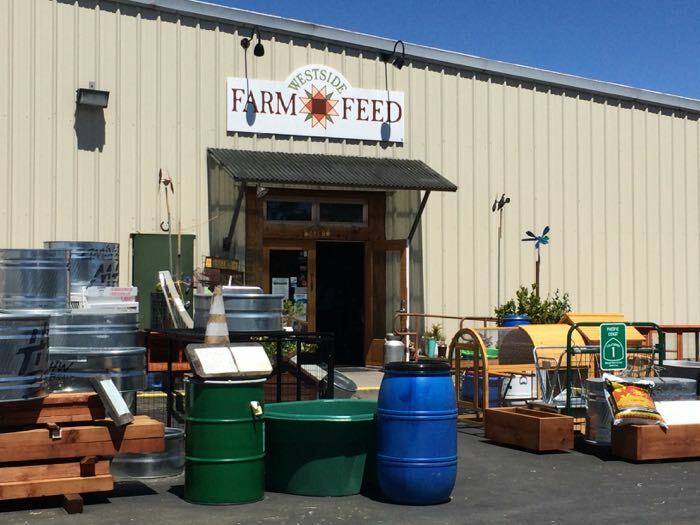 And one was a classic feed store. 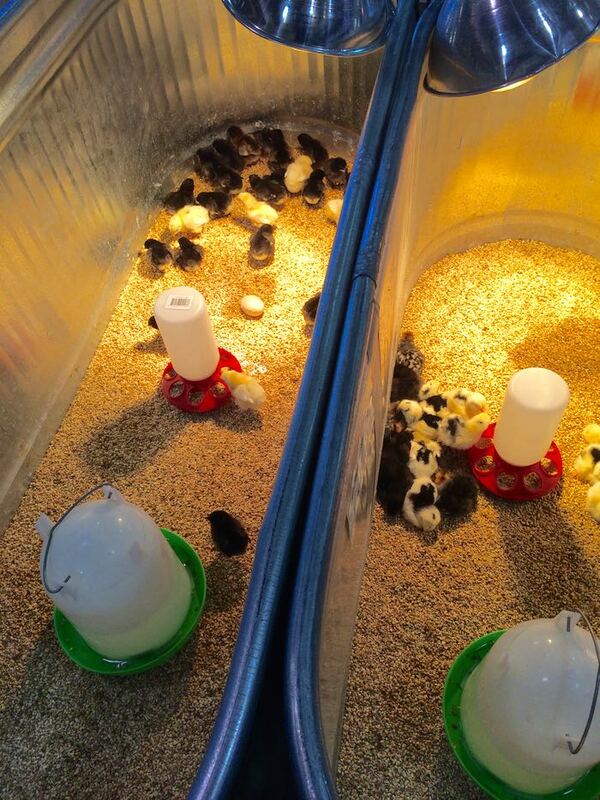 It’s chick season everywhere. I wish this place was near me. I’d pick up a few. What a great selection, there are Iowa Blues, Campines and Leghorns, and they’re vaccinated for Marek’s! I’m back home where the sky isn’t quite as blue, and it’s not quite as warm, but it feels like springtime (finally!) and it’s time to plant the lettuce. 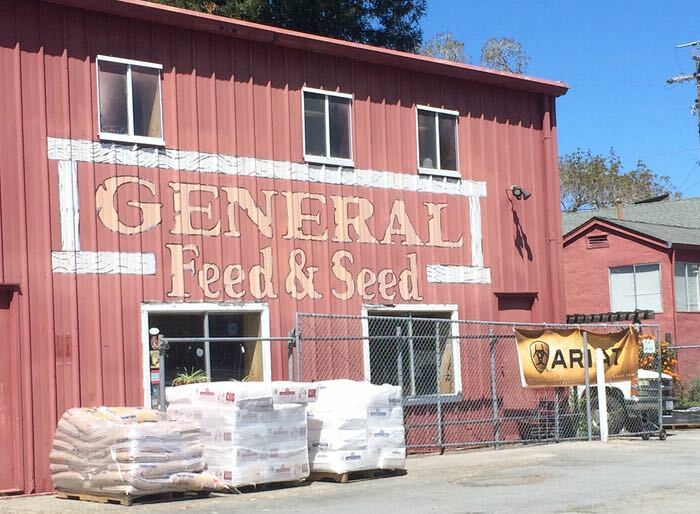 It’s funny how no matter where they are, feed stores all have the same general look and feel to them. :) And that’s my kind of shopping too! Oh, how I miss the beach!!! It’s one of a few things I do miss from California. I lived in southern California as a child. 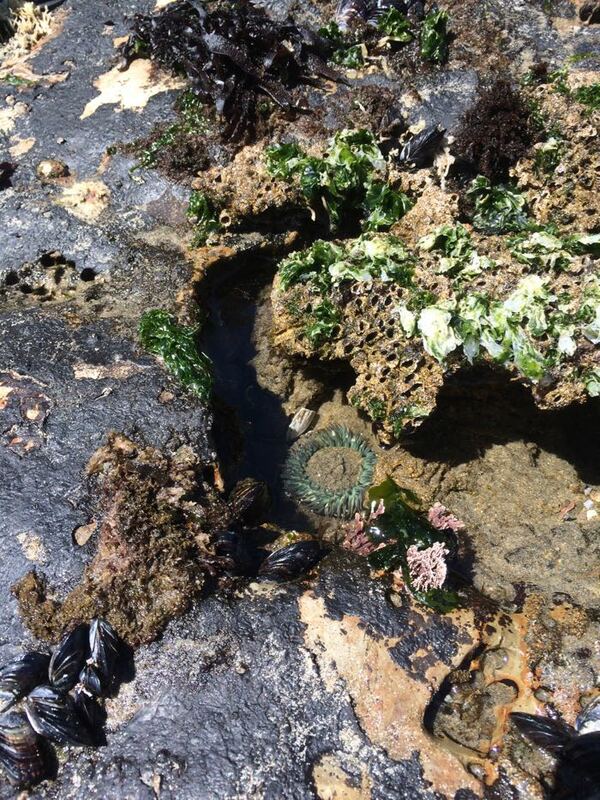 The tidal pools always amazed me. All those creatures hanging on to life till the next high tide. You must have had a wonderful time. 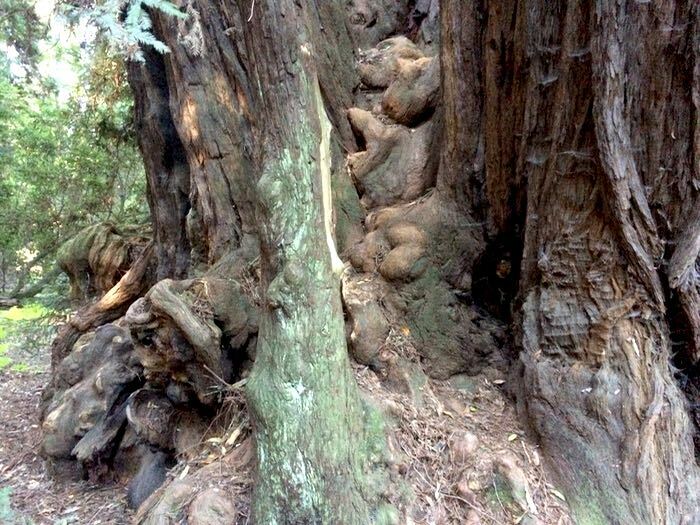 Did you know that there are people going into the redwood forests and cutting off the burls for woodcarvers? Evidently burls are collector items. It is sooo sad. 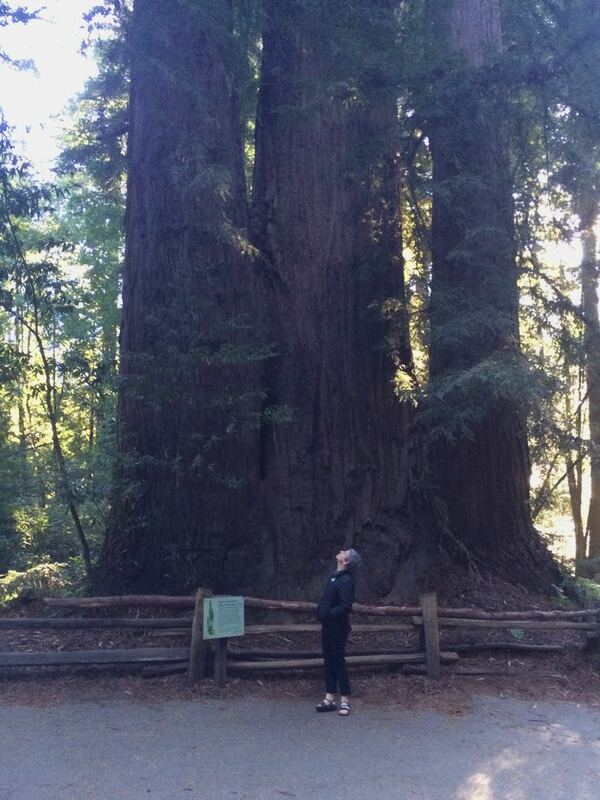 I look at those beautiful trees and think about all the history they’ve seen. What a wonderful weekend! Thanks for the pics! 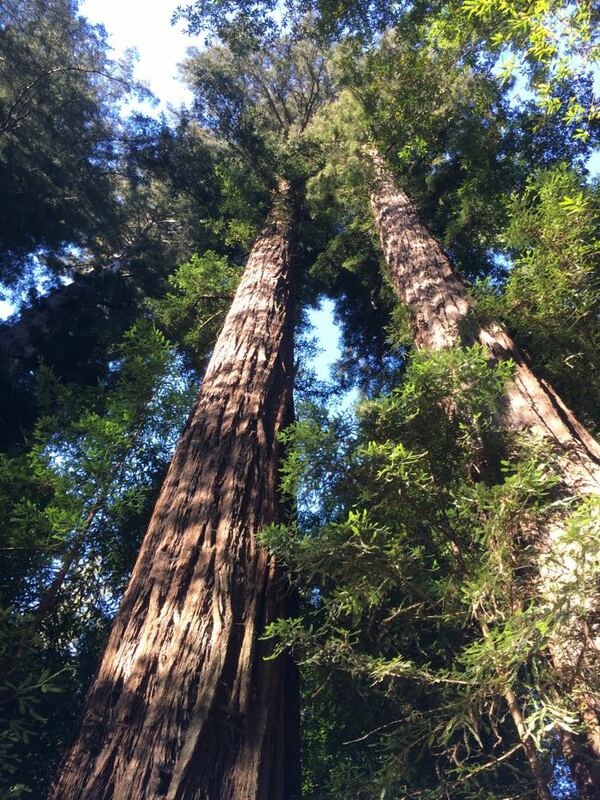 Of all the things I’ve seen in nature the redwoods simply captivate me. It is one of those things in which you actually have to see to believe, feel and understand. Speaking of koi, I mentioned in one of your posts a couple weeks about not seeing my fish in my pond, well Friday I started the spring cleaning of the pond which requires draining about half the water. I ended up draining the whole thing because: My fears came true not one fish, not one bone, fin, tail nothing. I’ve never been so confused. The koi was over 10 years old and the 15 to 20 goldfish were all about a foot long and pushing 10 years. I’ve never lost a fish before, my pond is 4 feet deep so raccoons and other four legged predators are out. I am only 2 miles from the Missouri River as the crow flies but I’ve yet to see a blue heron and I asked all the neighbors this weekend if they had seen any large crane or heron looking birds around and the answer all around was no. I spend a lot of time in my yard and I really believe if it was a bird of prey I would have seen it. I’m baffled. I shall not be deterred I made a trip to the pet store yesterday and bought a dozen feeder fish to restock. Someone at work mentioned that and I said I doubt it because if it was a mink I wouldn’t have any chickens either. I have a very heavy guage 1 x 1 inch wire stapled over my chicken house windows. A mink easily could enter. I am (was) only concerned with raccoon and possum. I went with that type wire because I had no reason to believe mink or weasel would be an issue and hardware cloth collects the dust. Maybe I should rethink it. So glad you got to experience the beauty of the west coast in Spring-time. Have you been before? And a note to Ken….I expect you might have had a visit from a hungry snake or 2? I had them in my pond last year and they ate both my frogs. Probably because kids these days don’t know that carrots grow in the ground much less a chick hatches from an egg. Any one else notice the one knot on the redwood tree looks like a pigs head? Ken, is there a chance it could be otters they cleared my son’s huge pond and some of his Koi were over 2′ long. He lost hundreds of fish, his pond is like a small lake !! Jan I doubt it is a river otter. I am not close to any creeks or streams that would give them access from the Missouri River. They would have to cross a 10 lane freeway plus a couple other very busy streets if they traveled by land from the river to my house. Only two and a half years our of California now. I was born, raised, and lived there my whole life. Sixty-some odd years. WA is beautiful, but CA does have those beautiful redwoods. There’s no way to explain them is there? You just have to be there. Your photos make me want to take a road trip! 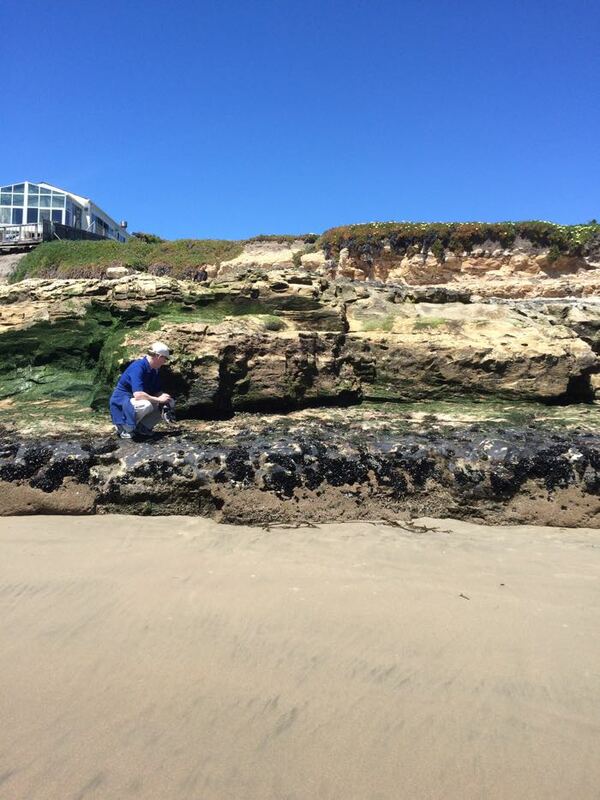 Glad you got to see the tide pools too. They are so amazing. Sounds like you had a great time…of course with the shopping too! Oh, this post made me homesick! 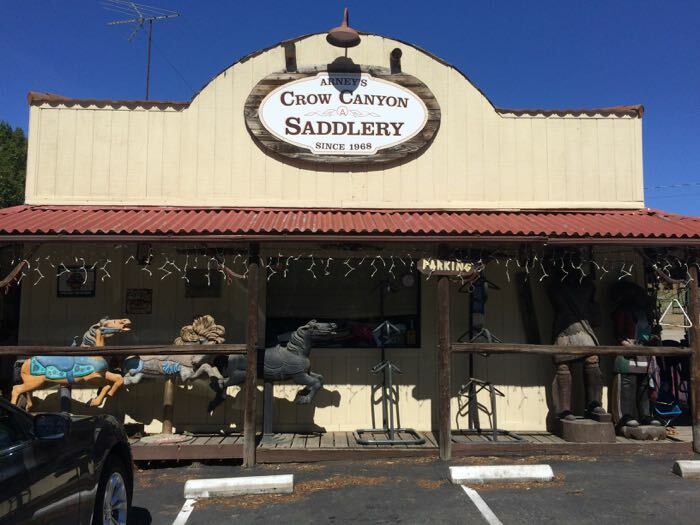 Crow Canyon Saddlery is only 15 miles east of my East Bay abode (as the crow flies) and it is a good thing that they aren’t selling chicks because then I’d have to go there and then I would have to buy a saddle…and a bridle…and a horse. My husband won’t even let me get a goat or a miniature horse but he does have a soft spot for chickens so we’re getting 2-3 chicks to spice up life for Scarlett and Henny Penny. Glad you had a great trip and caught the warm weather. Thanks for that tip. Hopefully, we’ll have an excuse to go back.